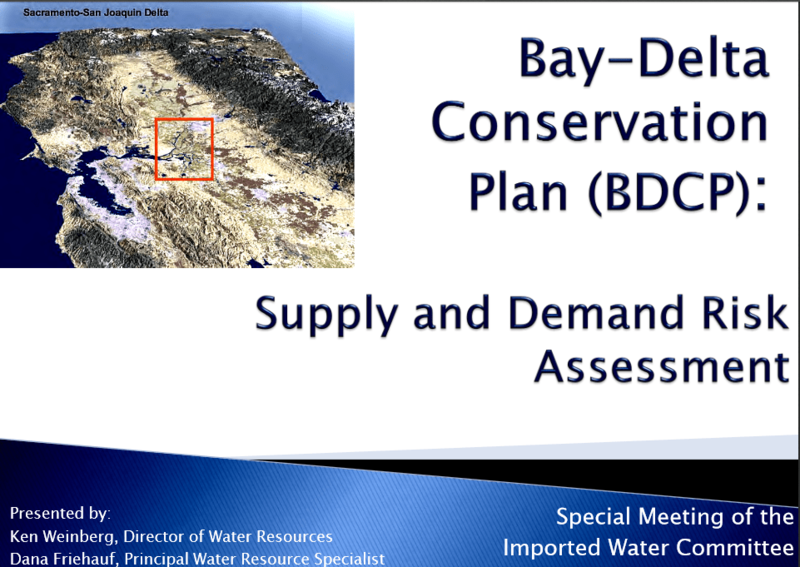 On January 9, 2014, the San Diego County Water Authority’s Imported Water Committee held another workshop in a continuing series of workshops that are focusing on the Bay Delta Conservation Plan as the Authority prepares to submit formal comments on the BDCP before the April 15 deadline. Yesterday’s post covered the the first half of the meeting with Water Authority Engineering Director Bill Rose and Engineering Manager Gary Bousquet giving a preliminary analysis of the BDCP’s proposed infrastructure. 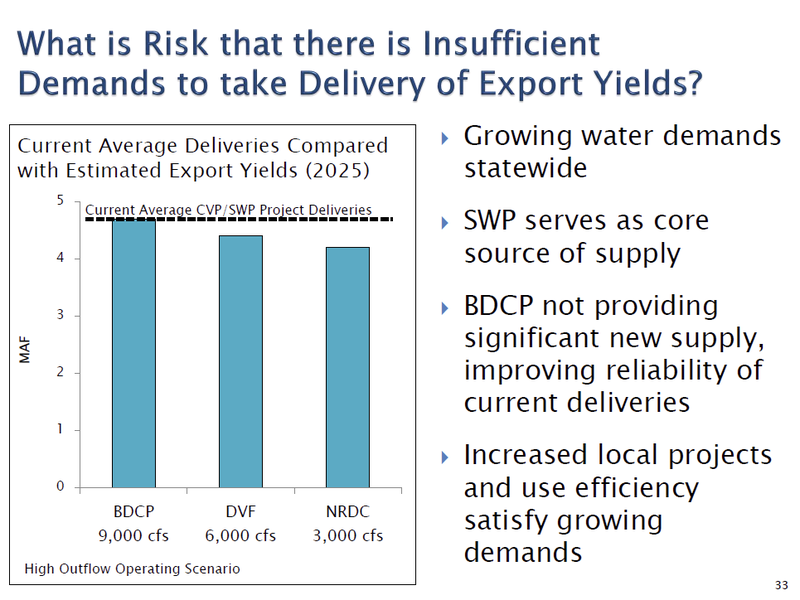 Today’s post covers the second half of the meeting with Director of Water Resources Ken Weinberg and Principal Water Resource Specialist Dana Friehauf giving an assessment of the supply and demand risks of the BDCP. Ken Weinberg’s presentation continued the discussion of risks, moving past the engineering and project risks and instead, focusing on supply and demand, water reliability and the environmental risks that surround the BDCP. He began by saying that they were evaluating the public draft released in December, and would have more to report at the February meeting. He noted that the projected export yields are consistent with what was in the administrative draft, so they won’t have to redo those analyses. The objective of staff’s review is to provide the Board with an assessment of which proposal is most consistent with the Board’s Bay-Delta principles as well as the reliability and diversification goals set in the 2010 Urban Water Management Plan, he said. 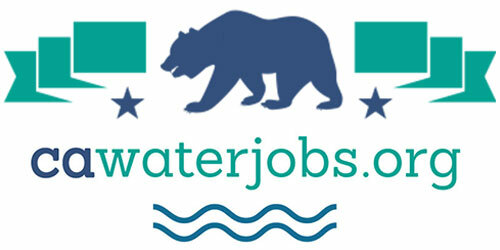 “Your board has not endorsed a preferred Delta fix solution, nor staff has not recommended any,” he said, noting that the options being the options would be that we are evaluating are the No-Action Alternative, the 9,000 cfs BDCP preferred alternative, the 6,000 cfs Delta Vision Foundation’s BDCP Plus, the 3,000 cfs NRDC’s portfolio alternative. He noted that the NRDC proposal and the Delta Vision Foundation proposal are differentiated from the proposed project in that they include south of Delta storage and increased local supplies instead of a larger conveyance. Seven years and $250 million has been spent by the state and federal governments on this plan and we can’t duplicate that, he pointed out, so this is going to be a high level review based on the perspective of a recipient and purchaser of Delta exports. “There are a lot of issues that are attached to this project but we really are trying to look at from what is most important to the Water Authority,” he said. The main deliverable will be the comment letter that is due in April, which the efforts of the committee will be focused on starting in February. Staff will provide an assessment of the reliability of the project, the financing of the project, the impacts on rates, and risk assessments to try and give you a sense of what is the risk and the costs that relate to that. Mr. Weinberg turned the presentation over to Dana Friehauf, principal water resource specialist, who then summarized some of the analysis that has been done to date. Ms. Friehauf began by emphasizing that it’s isn’t necessarily the size of the conveyance, but more importantly, it’s the operating scenario, which is comprised of the regulatory standards and rules that will govern operation of the projects. “I can’t stress enough how much the operating scenario that they ultimately choose to operate the facilities will have on the export yields,” she said. Ms. Friehauf then presented a slide of a previous analysis of the four alternatives that showed the estimated average export yields under the high outflow scenario for the alternatives being studied. The colors represent the split between the existing diversion points with the south diversions in blue and the proposed north diversions in yellow. 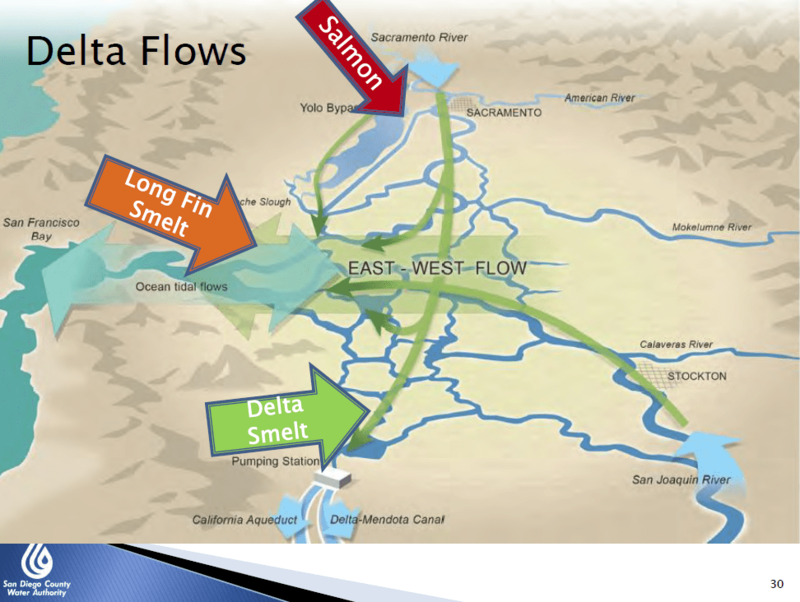 Ms. Friehauf noted that there is an even split between the two diversion points on the proposed 9000 cfs project, but the 3000 cfs project would still rely on the existing south Delta conveyance about 72% of the time. These are based on modeling results that were contained in the BDCP, she said. 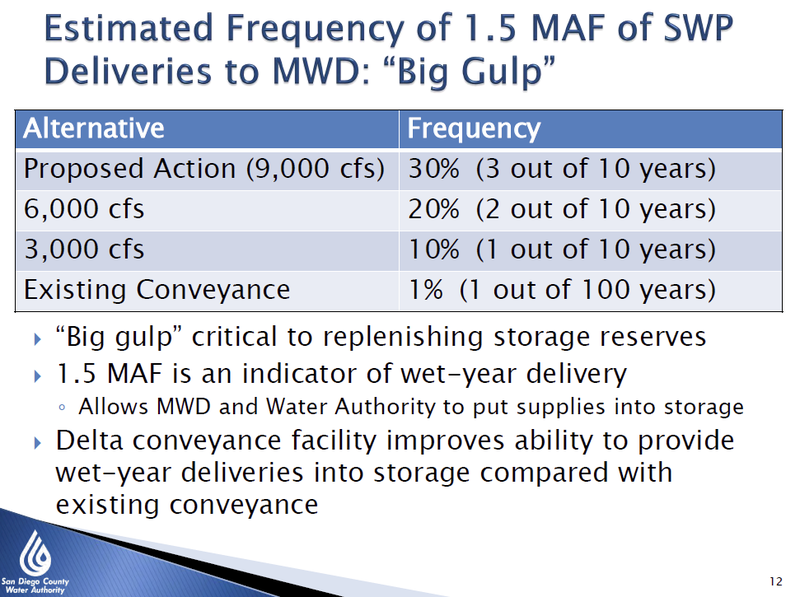 She then presented a slide with the results of the analysis, noting that they considered 1.5 MAF of State Water Project deliveries to be a ‘big gulp’ of water. “It’s clear from the analysis that all the conveyance options provide a more reliable wet year yield compared to the existing conveyance, and that the 9000 cfs does provide the ability to more frequently take the water and place it into storage,” she said. Adequate dry year supplies are really the key to State Water Project reliability, and dry year reliability of SWP supplies needs to be seen not only as the yield from the SWP but also the availability of stored water, she said, noting that the frequency and volume of the wet year SWP deliveries is critical to replenishing the storage and having that stored water available in a dry year. 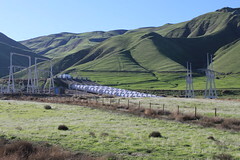 Next, staff evaluated the potential for additional local projects as well as south of Delta storage to improve the overall reliability of a smaller conveyance. “This is consistent with the approach of the NRDC and the Delta Vision Foundation proposals,” she said. “We also want to look at the risks associated with these options, compared with the BDCP proposed action.” She emphasized that this is a reliability assessment only that doesn’t take into account the costs or financial impacts. Both the NRDC and the Delta Vision Foundation proposals are both ‘portfolio’ concepts, with in-Delta components, such as habitat restoration, levee improvements, and out-of-Delta components, which are local and south of Delta storage projects, and other programs. The premise is to integrate these components as a comprehensive Delta solution, she said. She noted that the Governor’s water action plan also recognizes the importance of an integrated approach to addressing the state’s water issues, but in that case, it is envisioned that the components would be developed individually by the state, federal, regional and local agencies. 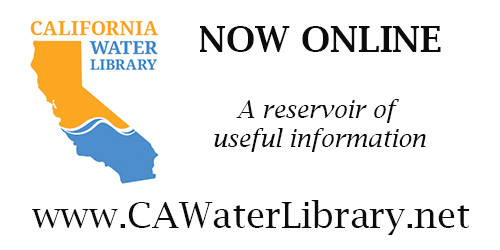 She added that there are other statewide planning efforts that also focus on integrations throughout the state, such as the California Water Plan and the Delta Plan, as well as the CalFed surface storage investigations. 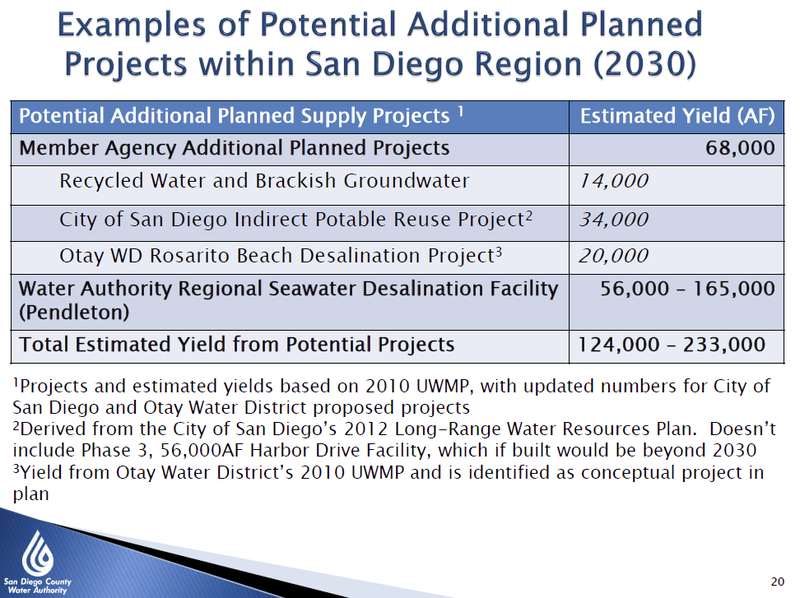 She then presented a slide that listed potential projects within the San Diego County region. “These would be additional plan projects beyond what is existing and what is now considered verifiable in our urban water management plan,” she said. 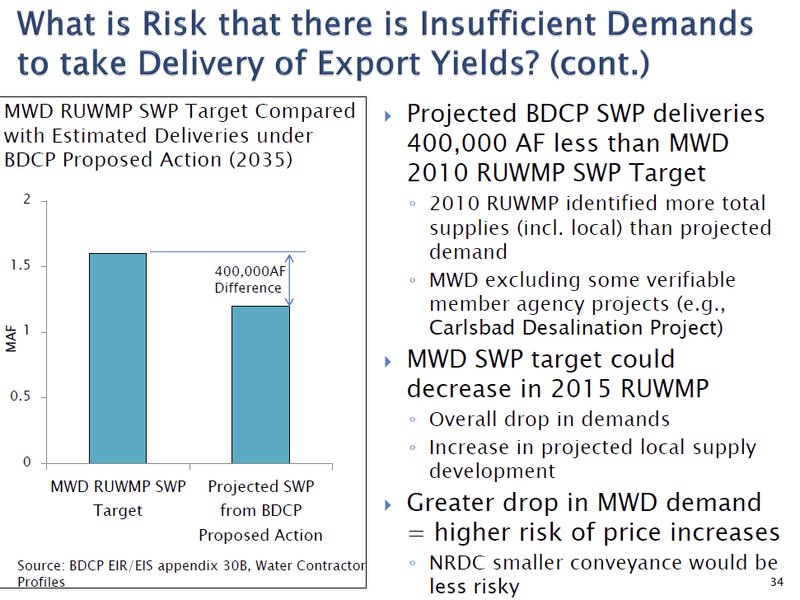 “These projects are more at a feasibility level rather than what we consider verifiable in our UWMP, and these would be the projects that could help offset a decrease in yield from MWD in a dry year,” she said. Permitting risk – Can the project alternatives obtain the major permits to construct and operate all the components to provide that water supply. Schedule risk – What’s the likelihood of these project alternatives actually providing what they say they’ll provide by in the needed time period. 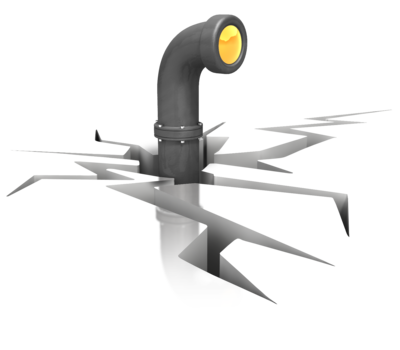 Implementation risk – how complex and difficult is it to implement the supply and environmental components of those alternatives. Supply risk- what is the likelihood that if implemented, the project alternative will achieve the desired yield of water supply. Demand risk – the likelihood that there’s insufficient demand to take the yield identified in the proposal. 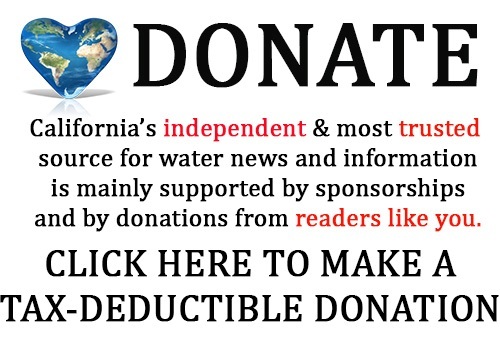 “And the more reliant we, the Water Authority, are on external parties for implementation, the more risk to San Diego County supply reliability, which gets to the issue on local projects. And the larger the project, the greater the implementation risk, just because it’s big and usually big stuff is harder to do,” he said. 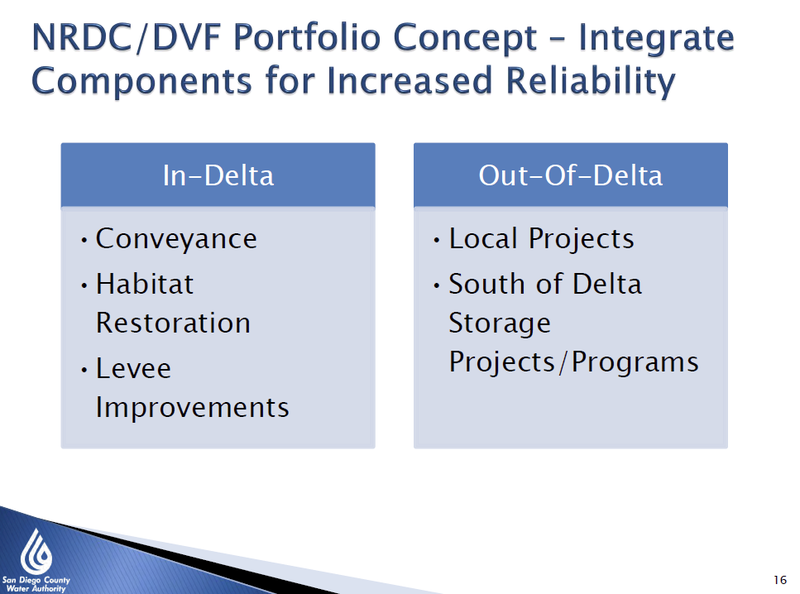 The NRDC and the Delta Vision Foundation contain two components: In-Delta components, such as conveyance and habitat protection, and out-of-Delta components, such as south of Delta storage, and using storage to increase the yield of the smaller capacity conveyance, which means regional and local supply projects, he explained. Since there were no specific storage projects proposed by either of those alternatives, it is difficult to analyze permitting, schedule, and implementation risks, but we were able to have enough information to analyze the risk of getting the supply needed out of south of Delta storage, he said. The major permitting risk with the NRDC option is that they have a proposed a much lower habitat restoration acreage – 40,000 acres compared with 153,000 acres that the BDCP proposes, he said. “Now there is some reduction and mitigation under what’s called direct mitigation because the conveyance is smaller and there’s only one tunnel, but direct impacts, even on the proposed, are very small compared to the restoration acreage,” he said. “The restoration acreage is designed to contribute to the recovery of these species, and so it really is independent of how big you build the conveyance options.” The biggest risk for this option is since the NRDC has taken a much different approach to habitat restoration, it’s unclear whether their proposal would satisfy the permitting requirements, he said. He noted that the Delta Vision Foundation did not provide a specific acreage amount, but the BDCP analyzed the 6000 cfs tunnel and identified a restoration amount that was pretty close to the 153,000 acres specified in the proposed project. In terms of schedule and implementation risk, opposition and litigation is the biggest risk to schedule risk of the in-Delta components of any alternative, he said. “It’s clear that the in-Delta users, environmental groups and other stakeholders will oppose the 9000 cfs alternative, but it’s likely that the exporters who have the cost responsibility are not going to support the smaller 3000 cfs conveyance, so either way, you’re going to have very unhappy people and that’s going to contribute to delays,” he said. “There is some reduced scheduling risk with the single bore tunnel because there’s just less to do, but I’m not going to say it’s entirely risk-free or significantly less risky, but there’s just less to do,” he added. 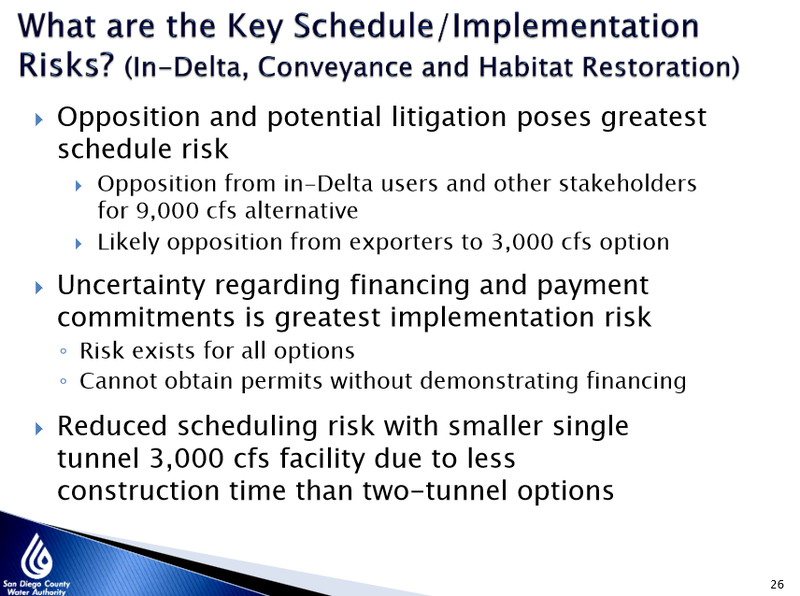 There are key permitting and schedule implementation risks for out-of-Delta components as well. He then presented a graph which plotted various supply projections from recent years. He pointed out that in the year 2000, there were a lot more projects under consideration than the ‘verifiable’ water supply targets estimated in the 2005 and 2010 Urban Water Management Plans. “Things came down mostly because of the growth in water legislation, SB221 and 610, that really addressed having evidence and documentation that you were pursuing this project in the context of cities and counties relying on that information in making land use decisions,” he said. 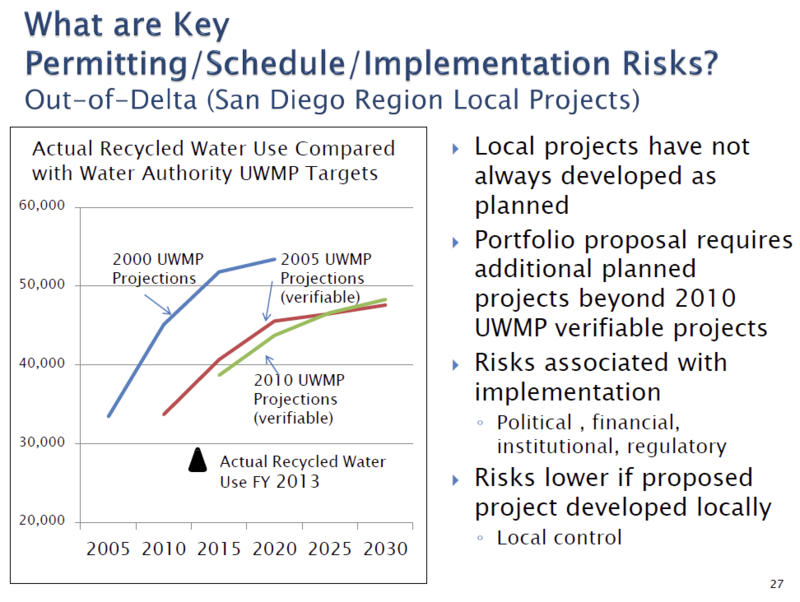 “So local projects haven’t always developed as planned, and in the portfolio approach, you need additional projects beyond what’s verifiable in the 2010 UWMP,” he said, noting that there are risks associated with implementing anything. “You’ve got to get past political, financial, institutional, and regulatory issues, but we feel the risks are lower if you develop it locally within the region as opposed to relying on others because you can manage those risks better with local control,” he said. He noted that the state is trying to mitigate some of those risks. “They’ve identified recently in the draft documents some strategies to make sure that there is enough water in the system to meet the outflow criteria, but some of those strategies may wind up costing the exporters money, and we don’t know,” Mr. Weinberg said. The first obligation of the SWP and the CVP is to deliver water to the contractors, which means any new storage last in line to get water if there is excess water, he said. 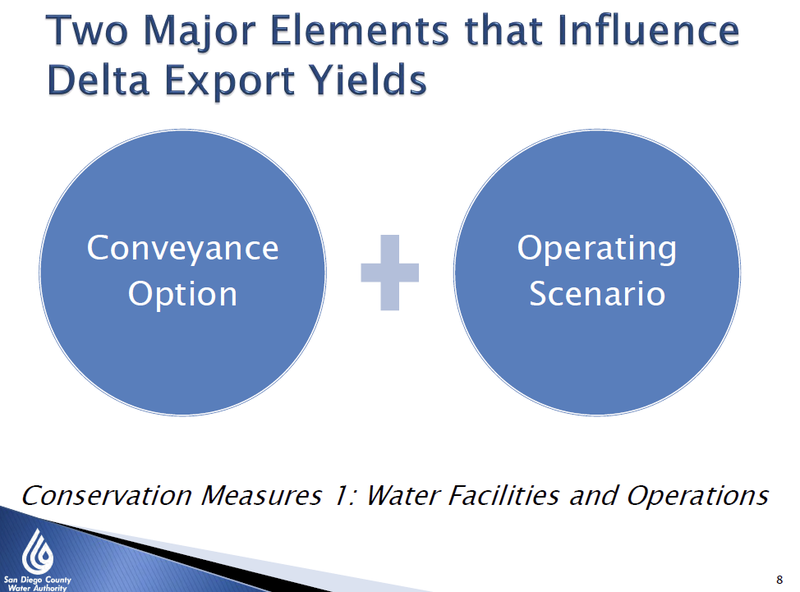 The BDCP did conduct an initial analysis of adding 1 MAF in new storage (Appendix 1B of the EIR/EIS) and determined that a 9000 cfs conveyance increased the average total SWP and CVP Delta water exports by approximately 150,000 acre-feet per year, with virtually all of that increase occurring in very-wet years. The analysis with a 3,000 cfs conveyance was found to increase the average yield by approximately 50,000 acre-feet per year. “So what does it all mean. From the beginning, this risk assessment was conducted solely from a water resources perspective. We’re going to come back with the cost elements at a later date. We focused on reliability for California and specifically the San Diego region, said Mr. Weinberg. 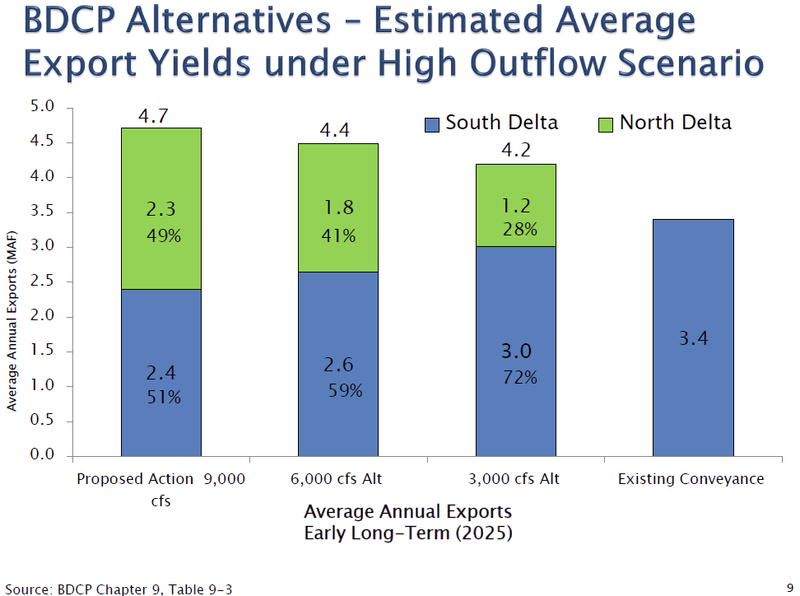 “Under the high outflow criteria and limited conveyance capacity, new south of the Delta storage provides limited benefit to increasing SWP yield. 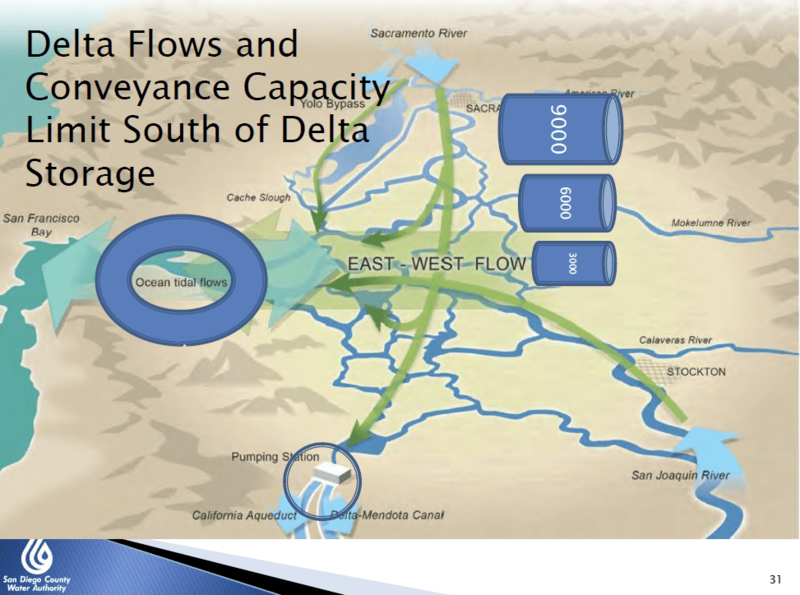 You can’t make up the entire difference from the smaller capacities, and filling Metropolitan’s and the Water Authority’s storage is more important to imported water reliability than new south of Delta storage. We need to fill those storage reservoirs first,” he said. “If you can get a relaxation on the regulatory standards, than it may be worth looking at south Delta storage because you can get more yield benefits and it’d be more beneficial, but that rests on successful restoration and species recovery.